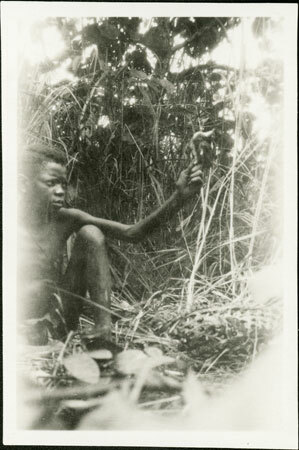 An operator of the poison oracle (benge), a boy identified as wiri dawiri Tupoi i.e. Tupoi's sister's son, sitting on the ground holding a fowl in his outstretched arm that has been given benge poison. Beside him is an open weave basket containing other fowls to be used with the oracle. Manual Catalogues [typewritten, entitled "Zande Photographs (E-P)"] - 247. Boy (wili dewili Tupoi) performing benge oracle . (Small size). Morton, Chris. "Consulting the Zande benge oracle" Southern Sudan Project (in development). 03 Jan. 2006. Pitt Rivers Museum. <http://southernsudan.prm.ox.ac.uk/details/1998.341.247.2/>.